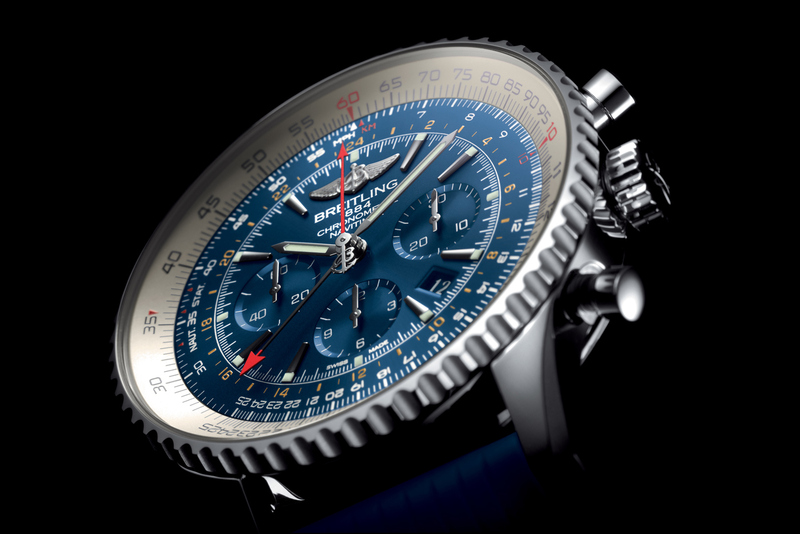 Breitling release the latest in their cult Navitimer series with the COSC certified Breitling Navitimer GMT Aurora Blue, limited to 1,000 pieces and available for £6,870 ($12,270AUD). The limited series of the GMT Aurora Blue (Model Reference: AB04411A|C937|258S|A20D.2) features the exclusive blue dial and a matching blue rubber strap textured to represent aircraft tire tread (also available with a leather strap, crocodile leather strap or a steel bracelet). The impressive 48mm steel and 18K red gold case houses the automatic Breitling B04 movement, which can also be found in the Transocean Chronograph GMT and Chronomat GMT pieces. The 47 jewel B04 movement is made in-house by Breitling and boasts a COSC (Swiss Official Chronometer Testing Institute) certified chronometer and a 70Hr power reserve. The instantly recognizable cased piece weighs in at a reasonable (especially for Breitling) 117.4 grams without the strap. The caseback is a transparent sapphire crystal giving you a beautiful view of the self-winding movement. Breitling have included the entirely crown-adjustable dual timezone arrangement making this a truly functional travel companion.